Beeswax by the lb. - shipped in increments of 1 lb. 1 lb. minimum. Our beeswax is food grade. Beeswax is a natural wax taken from melting the walls of the honeycomb made by the honey bee. The wax is melted with steam or hot water and activated with carbon and/or diatomaceous earth, and aluminum or magnesium silicates can be added to extract impurities to refine the wax. 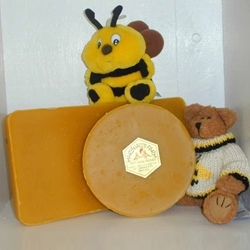 Food grade beeswax is used as a glazing agent on food products such as fruits. Beeswax is used in many skin care products because it provides a protection against irritants while still allowing the skin to breathe. It also offers anti-inflammatory, antibacterial and antiviral benefits making it helpful in treating skin irritation.